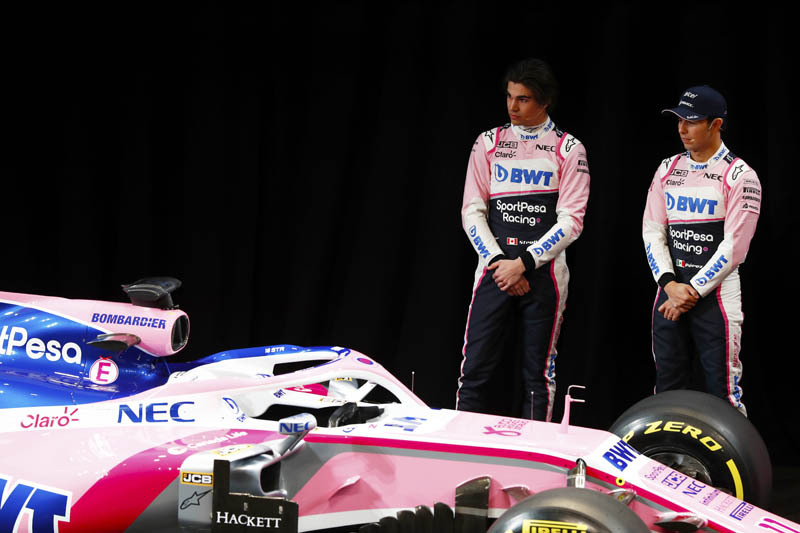 New name, new livery and new line-up, Sergio Perez and Lance Stroll look ahead to the new season. Sergio, how excited are you to be driving for SportPesa Racing Point in 2019? Sergio Perez: I’m very excited about this new chapter and ready for the challenge ahead of me. The start of a new season is always massively exciting and after a few months away from the track you just want to jump in the new car as soon as possible. Last year was very complicated, frustrating and sometimes painful, so my hope is that I can simply focus on my driving this year and on delivering the best possible results for this team. Does it feel like a new team? Or the same team with fresh energy? SP: It feels like a new opportunity to show what this team is capable of, especially with everyone 100% focused on improving the car. There is a new team name, but I am still working with the same people and we have spent five years together now. They have helped me improve as a driver and we have enjoyed good moments in the past. The potential for the future is what excites me. I believe we can achieve something special together in the years ahead. How was the winter? What have you been doing since Abu Dhabi 2018? SP: Just the usual things: recharging my batteries, sharing time with my family and enjoying everyday life. The holidays are always the perfect time to relax, enjoy your free time and forget about the job for a while. Last year was a tough one, so I really needed the break. I spent some time in the mountains – doing some skiing – and then I went to Puerto Vallarta for the sunshine. I played some sports such as golf and tennis, but the most important thing over the last few months was spending quality time with my family. We’ve seen videos of you training in the gym on Instagram. How is your physical condition? SP: I always train hard over the winter, but it feels like each year I push myself to improve even more. I believe that by the time I arrive in Melbourne I will be in the best shape of my entire career. You always say you believe in this team – what makes it so special? SP: I think it’s the commitment of each person who works for the team, both trackside and in the factory. There is an amazing atmosphere and determination to succeed. Even during tough times, such as last year, they never lowered their ambitions; they always kept their heads up and that is something for which I am very grateful. Their energy motivates me to do the same on and off the track. Without a doubt, the best thing about this team is the people. What goals do you have in mind for 2019? SP: I want to take full advantage of every opportunity to score points and reach the podium. I want this team to be the best of the rest once again. So I’m completely focused on that. My motivation is incredibly high and I think the priority this year is to help the team take a good step forward. There are new rules for the aerodynamics this year. How does this make you feel as a driver? SP: I don’t know what to expect until I drive the car. Everybody hopes we will get better racing with these new rules, but I think we also need to remember that the gap between the middle of the grid and the top teams is still too big. I think this is the real challenge for the sport and it won’t change overnight with just a change to the regulations. The most important thing is that we put on a good show for the fans and I hope these new rules are a step in the right direction. Two weeks of testing in Barcelona coming up soon – what are the priorities for testing? SP: Last year we struggled a lot at the beginning of the season, so I hope we can arrive in Barcelona with a car that represents a good baseline. We know that the teams we are up against will be difficult to beat and that’s why we need to maximise winter testing and work on performance before we arrive in Melbourne. There are a few things changing compared to last year, such as the new front and rear wings, but we need to leave Barcelona with good information and plenty of miles under our belt. Lance, a new team and new faces – how are you finding the new environment? Lance Stroll: I’m feeling really good about things. I can see how much potential we have in this team and there’s an incredible buzz in the factory and so much enthusiasm. I feel comfortable already and everybody has given me a great welcome. It’s the next chapter in my racing career and I just can’t wait to get in the car and start the proper work. What has impressed you most about this team? LS: The attitude is what I really like. They are racers at heart and you can see that when you walk around the factory or sit in engineering meetings. The focus is simply on how we get performance to the car and it’s really refreshing. I’ve seen what this team achieved in the past and it’s a real credit to the people involved. I’m looking forward to making our own history. How was the winter? What did you do? LS: I’ve come back feeling refreshed. I went back to Canada for a few weeks around Christmas time to spend time with family and friends, and I did some winter sports. I’ve been back at the factory since early January working with the team to get ready for testing. I’ve been in the simulator a couple of times each week getting comfortable with everything. Do you have any expectations or goals in mind going into the new season? LS: I always aim high so I want us to be competitive right from the start. It’s way too early to know how we compare to the other teams, but right here today I believe we should be fighting for points in every race. My goal is to get back on the podium in 2019 as well. Where have you focussed your energy over the winter months? LS: It has been a busy winter. I have been working really hard on my physical condition: I think I will be the fittest I have ever been by the time we start testing in Barcelona. I went on a training camp recently, which was really intense, and I’ve taken a slightly different approach compared to previous years. I have also spent a lot of time at the factory, working with the engineers, getting to know the team and building those important relationships. It means we can go to testing, hit the ground running and focus on results. Two weeks of testing in Barcelona coming up soon – what are the priorities? LS: My goal is to cover the planned mileage in the new car. We have maximised the time in the simulator over the winter, but nothing beats getting the car on track for the first time. This is when the real work begins, getting a feel for the car, how it responds, what works and where we need to improve. It’s an intense time but it lays down the groundwork for the rest of the year and I can’t wait. Check out our Racing Point livery reveal gallery, here.